Subtracting fractions is an important skill that 4th and 5th grade students need to master. This no-prep, print and go fraction subtraction with unlike denominators packet is perfect for extra practice of this concept. Perfect for an entire week of math homework that isn't overwhelming for students! Click HERE to SAVE 50% by buying the year-long 5th Grade Math Homework Bundle. 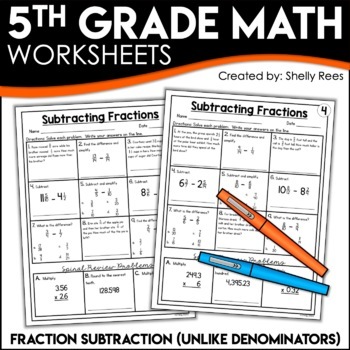 This resource includes 4 practice sheets for the skill of subtracting fractions. 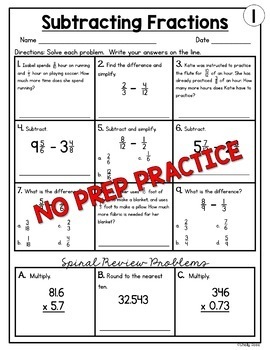 Each sheet has 9 practice problems for the skill and 3 spiral review problems at the bottom. Although the packet is designed to provide math homework, it can be used in other ways (see below). If you choose to use it as math homework, there is one sheet for each night of the week, Monday-Thursday. With 9 problems for each night, it will not be too time-consuming for the student, but will provide enough practice to solidify understanding of the skill. While this packet was specifically designed to align with 5th grade standards, it is perfect for differentiation in 4th and 6th grades.